LA COMES TO LONDON! 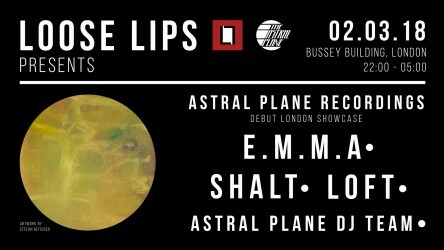 Fri Mar 02 - Loose Lips heads to The CLF Art Cafe, Block A, Bussey Building for the second stunning instalment of cutting edge shows from across the globe with a line up to truly dance for. 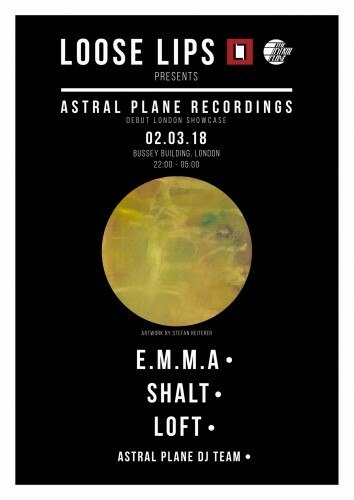 Loose Lips hosting the highly influential LA Based ASTRAL PLANES record label's first ever showcase in London, with TAP label owner GABE, flying over from LA to accompany 3 of the label’s seminal artists - E.M.M.A., SHALT and LOFT! Astral Plane Recordings have been releasing antiquities of the future since 2012, sending listeners wonderfully insane with their apparent ‘deconstructed club music'. Their interesting blogging and fascinating label releases are founded on the principles of fighting exclusivity and breaking down the norms of the music industry, always focused upon the very best independent less-known artists. 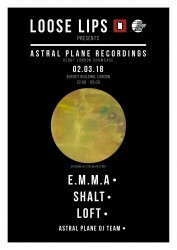 Gabe Meier's platform has seen physical releases from NTS Manchester's eminent wunderkind of night sonics LOFT, surrounded by a veritable digital barrage from long-term C4E dancefloor devourer SHALT, plus the ever-evolving nocturnal audio catalogue of generation-inspiring super producer, E.M.M.A.. Topped by a round of future DJ'd stunners courtesy of TAP's founder, and you have a recipe for a truly special night at the CLF.